The Council on American-Islamic Relations (CAIR) issued a news release last week touting an Air Force decision to review courses on prison radicalization taught by Patrick Dunleavy, an Investigative Project on Terrorism (IPT) fellow. "We welcome this review and hope it results in our military personnel receiving training based on balanced and accurate information, not on personal or political agendas," said CAIR-Florida Communications Director Wilfredo A. Ruiz. The statement actually exposes the empty and cynical nature of CAIR's complaint and shows that the true intent is to pressure the Air Force into silencing Dunleavy. CAIR has no idea what is in Dunleavy's instructional material. If it did, it would cite examples to illustrate its concern. This is the second release in CAIR's campaign against Dunleavy. Neither cites anything related to his teaching. The only other explanation is that CAIR has seen the material and cannot point to any inappropriate content, but chooses to smear Dunleavy as an "Islamophobe" despite that. As we pointed out after the initial attack on Dunleavy, the only examples CAIR could provide to attempt to justify its request came from a 2011 article, none of which attacked or stereotyped Muslims or supported CAIR's claim that he "does not fit the U.S. military's standards for a subject-matter expert." His resume proves that he is eminently qualified to teach such a course, which addresses a very real problem, as numerous terrorists have been converted to Islam and/or radicalized in prison. Dunleavy is the former Deputy Inspector General for the New York State Department of Correctional Services. He served 26 years in the New York State Criminal Justice System, beginning as a corrections officer and rising through the ranks to become the head of the Criminal Intelligence Division. He joined the intelligence division after 9/11, and was instrumental in providing agency resources to the United States Marshals' New York/New Jersey Fugitive Task Force. He has also briefed members of the New York Joint Terrorism Task Force on the nexus of incarcerated foreign born individuals and terrorism. In 2011, Dunleavy testified as an expert witness before the House Committee on Homeland Security regarding the threat of Islamic Radicalization in the U.S. Prison System. He is the author of The Fertile Soil of Jihad: Terrorism's Prison Connection (Potomac Books). Again, if Dunleavy purveys unbalanced, inaccurate information, CAIR failed to cite any examples among the book's 142 pages. He also has written extensively on the subjects of counter terrorism and law enforcement for various news organizations including the Washington Times and the New York Post. CAIR's primary beef seems to be that Dunleavy works with the IPT and publishes articles here. The news releases spend more time trying to tarnish the IPT and Executive Director Steven Emerson than trying to show why Dunleavy shouldn't continue teaching. Though the classes are put on by the Air Force, they include officers and enlisted personnel from all military branches, and some federal law enforcement officers. As we noted in March, there have been no complaints from students in the five years Dunleavy has taught. CAIR simply saw a connection to IPT and decided Dunleavy had to be silenced. It is classic guilt by association and it is baseless. To pretend Islamic radicalization in prisons doesn't exist, as CAIR does, is to ignore the ongoing series of attacks in Europe by terrorists who were radicalized behind bars, from Westminster Bridge attacker Khalid Massood to Brussels airport and metro suicide bombers Brahim and Khalid el-Bakraoui. In the U.S., a terror cell formed in New Folsom prison by Kevin James and Levar Washington plotted to attack army recruiting centers and other military targets along with the Israeli Consulate and synagogues. In New York, four men hatched a similar plot to attack Jewish targets in the Bronx. They also wanted to shoot down military aircraft. When Bastille Day festivities in Nice turned to slaughter last year by an Islamist driving a stolen truck, CAIR Executive Director Nihad Awad argued the attack, claimed by the Islamic State, had nothing to do with religion. After coordinated 2015 terror attacks in Paris killed 130 people, CAIR tried to create a trending Twitter hashtag, "TerrorismHasNoReligion." The real culprit, CAIR insists, is America. American foreign policy which it claims is unfair to Muslims around the world, and American law enforcement, which CAIR tells followers, will sink to any depth to set up otherwise innocent and peaceful Muslims. Sami Osmakac wanted to blow up a crowded Tampa bar and a casino. He made a martyrdom video, put on a suicide bomb vest and loaded his car with other explosives before being arrested. CAIR, rather than express relief that a dangerous would-be jihadist was taken off the street, accused the FBI of setting up a "mentally disturbed youth." There aren't many people in the United States who have seen prison radicalization up close and studied it as long as Dunleavy. He has described Muslim prison chaplains who saw the 9/11 hijackers as martyrs and the shocking number of violent jihadis given positions as assistants for prison imams. In short, Dunleavy has first-hand exposure to the problem of Islamist radicalization in prisons and has devoted much of his life to its study. There is abundant evidence proving that CAIR was a front group for Hamas since its 1994 inception. Awad publicly expressed his support for Hamas at a symposium at Barry University in Florida on March 22, 1994, where he said: "I am in support of the Hamas movement." FBI agents uncovered evidence of CAIR's Hamas connection while investigating a Muslim Brotherhood-controlled Hamas support network in the United States. In April 2009, the FBI cited the evidence against CAIR in explaining why it had cut off formal communication with the group. The ban on outreach with CAIR would last "until we can resolve whether there continues to be a connection between CAIR or its executives and HAMAS," a senior FBI official explained in 2009. That policy remains in effect. 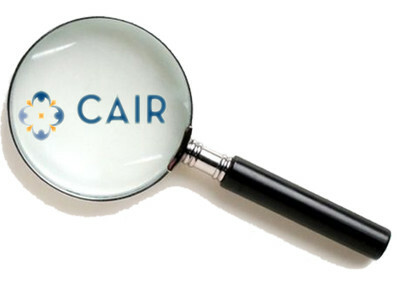 But independent of any Hamas ties, CAIR's actions make it clear that the organization is dedicated to disconnecting terrorism from Islam in the public debate. It insists "terrorism has no religion" no matter how many times the terrorists insist their actions are driven by the teachings of the Quran and a desire to protect Muslims around the world from America. CAIR's other message tries to scapegoat the FBI and stifle cooperation with it. Its "Know Your Rights" seminars for Muslims cast the FBI as an out-of-control monster: "They will do anything, anything within their power and oftentimes beyond their power to get you to talk," CAIR-New York board member Lamis Deek said at a 2011 seminar. "They will threaten you. OK? I've had one case where they tried to blackmail my client, I mean blackmail, seriously blackmail; that's illegal. But they'll do it." This came two months after CAIR's San Francisco chapter posted a flyer online urging Muslims to "Build a Wall of Resistance. Don't Talk to the FBI." In a June 2014 blog post, CAIR's Hassan Shibly argued that the purported "FBI entrapment program targeting the Muslim community" was an example of tyranny that strayed away from the "great ideals of liberty, equality and justice." In his view, the FBI manufactures terrorists through sting operations such as the one that targeted Sami Osmakac, who was convicted in 2014 on charges of attempted use of a weapon of mass destruction and possession of a fully automatic firearm. Shibly claimed that Osmakac was set up by an "FBI Agent Provocateur." Shibly has frequently claimed that the FBI is responsible for entrapment of Muslims and frames them for terrorist acts. 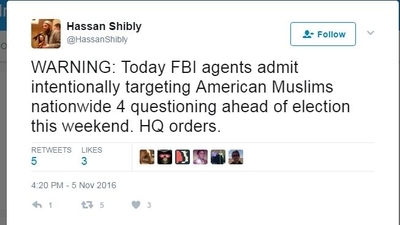 "WARNING: Today FBI agents admit intentionally targeting American Muslims nationwide 4 questioning ahead of election this weekend. HQ orders," he tweeted last November. This mindset of undermining law enforcement is directly relevant to CAIR's complaint against Dunleavy. Based on his own experiences and research, Dunleavy teaches about radical Islamist indoctrination and recruitment behind bars. To CAIR, this cannot stand no matter how much evidence there is to support it. It can't win on the facts, so it turns to the one tried-and-true tool in its kit: Call the messenger an "Islamophobe" or tie him to others already stigmatized. This is not an isolated example. It is CAIR's standard operating procedure to challenge the credibility of all counter-terrorism investigations, especially those involving informants and undercover agents. Finally, the Air Force review comes in a new political environment. Since the late stages of the Bush administration and throughout the entire Obama administration, a policy of minimizing connections between terrorism and radical Islamist ideology stifled much-needed debate and study. President Trump promised a new direction in his inaugural address: "We will reinforce old alliances and form new ones -- and unite the civilized world against radical Islamic terrorism, which we will eradicate completely from the face of the Earth." If the Air Force capitulates to CAIR and tries to silence Dunleavy, it will call the validity of this promise into question. It will embolden CAIR to launch similar campaigns against others with whom it disagrees. It also will deprive the military and law enforcement of valuable insights into real examples of radicalization that contributed to terrorist attacks and plots at home and in Europe.